The way we gauge food is highly relative. What may be good for some may not be good for others. I decided to have an innocent dinner at The Quirky Bacon a couple of nights ago. It's nearby and I've read and heard many good things about it in the past so we thought it was about time we give the place a visit. The place serves mid-high priced dishes and leans towards the experimental with bacon used the same way you would top a sundae with a cherry. I am all for bacon and trying new things but I think this placed concentrated more on creating "out of the box" selections rather than good old fashioned food. (but kudos to the chef for being highly creative and trying to offer something new). This chef I am talking about happens to be celebrity chef, Sharwin Tee of the Lifestyle Network's "Curiosity Got The Chef". The thing is, we weren't aware that he owned the restaurant before our visit (I only thoroughly read reviews after our visit, most of my pre-knowledge was from quick browsing and hearsay) so we got extremely excited when we saw him personally supervising his staff from the open kitchen. Our expectations sky-rocketed after that which I guess is pretty normal for anyone after finding out that your meal is being prepared by a highly regarded chef. Our daughter ordered the Creamy Dreamy Bolognese with a fancy description "spaghetti with braised kitayama wagyu shortrib, cream and liver pate". Sounds top notch but tasted like a regular Pinoy sweet spaghetti. The noodles were cooked a few minutes over al dente and I did not taste any hint of pate or wagyu at all. Pancake House makes a better Bolognese for much much less. We had to wait for 30 minutes to decide because that's how long it took for our food to arrive. Our daughter was well and done with her meal before we got to "enjoy" ours. Needless to say, we were famished by this time (around 8:30pm) and usually, food tastes extra excellent when you're hungry, but no. I ordered something new that wasn't on the menu yet and was recommended by our waiter because it was the only fish dish that wasn't "Dory" and I'm not really a fan of Dory. I forget what it's exactly called but it's something like a pan-seared swordfish (or similar fish) with malunggay pesto which I had with their drop-dead fried rice (because that was the side recommended to me and that's also a specialty of the house). Number 1: The fish was dry and overcooked. Number 4: The drop dead fried rice tasted amateurish, like a slightly less unappealing cousin of kamameshi rice. It was way too greasy and the flavor was too strong that it overpowered the fish. It tasted and felt like I was having "college food". The only good thing about this dish was the price. 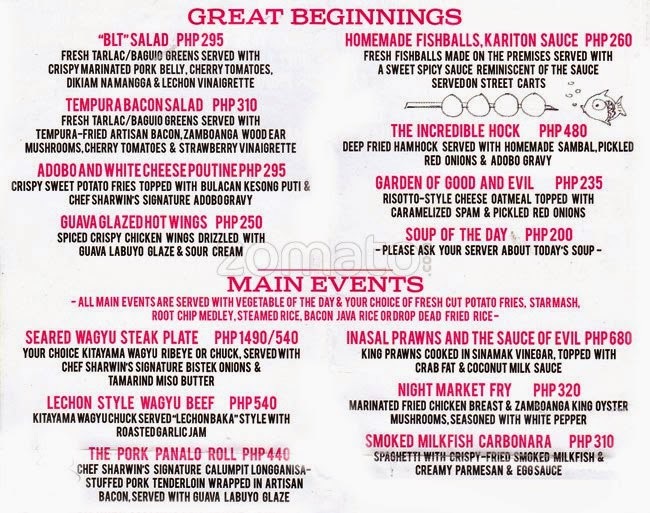 For P300, you get quite a generous portion. But still you know...this was fish with no bacon so I thought maybe me and my daughter just ordered the wrong things because both our orders were bacon-less. The Quirky Bacon Burger. Surely anything you attach your restaurant's name to has got to be one of your specialties right? Wrong. For P465, this was tiny...but still, I could forgive tiny for something orgasmic however, this was highly unremarkable. The bun tasted like grocery shelf-bought bread. The burger patty was small and according to Dennis (I feel bad writing this but these were his exact words), comparable to Burger Machine. I'm sure it was slightly better and maybe this was said out of exasperation but still, it couldn't have been much better (and at P465!?!) 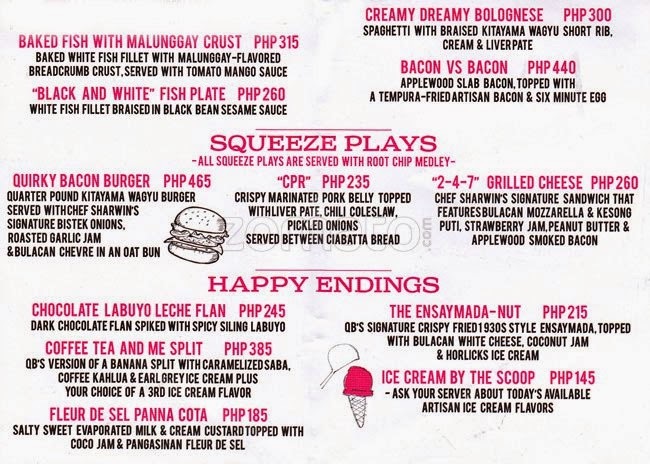 I can list more than 10 other establishments with a cheaper and better burger than this place. I am usually not this unforgiving when it comes to restaurants but I felt robbed. Knowing and seeing this celebrity chef in the kitchen supervising everything makes it all the more unacceptable. Maybe we ordered the wrong things maybe not, but in a celebrity chef owned restaurant with him actually working in the kitchen, with prices that can slightly raise eyebrows and with descriptions that promise to deliver the world, there should be no such thing as "ordering the wrong things". And lastly, I understand that bacon = grease but there is a proper way of doing things. Cooking with bacon doesn't have to result in dishes that are heavy and feel dirty on the palette. You extract the flavor but must not include the "lard-y" feeling in the finished dish. The Quirky Bacon rides on the pop culture fame that "bacon-everything" is good. It's not and I am extremely disappointed because of the high promise but poor delivery we experienced during our visit. Hi Sarah! Kudos for this. When it comes to food reviews I tend to believe bloggers who actually paid for their meal. Sad to say those who can provide honest feedback amidst a free meal are few and far between.